Once again it's time to unplug and give ultra-focus to my work in progress. Good Luck. I should try that its brilliant! This is a great idea. I hope you get a lot done! It's a great idea, to really focus on our work. Happy Writing to you this week! Clicked over from Jema's, enjoyed browsing here. Good luck! When you get back check my blog for an award I gave you :) Happy writing! I may try this sometime. 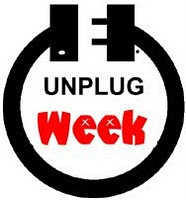 I hope your unplugged week is going well! This week didn't work out for me to unplug so I'm going to have to do it next week. It's so nice to have a break! That artwork is enormously inspiring! It would seem that without the interference of technology, the arts would flourish! I'm going to find me some muse today, too! I hope you're having a great unplug week!!! Hugs! Have fun! I think I'm gonna need one when I get home.